Habit: Annual (or perennial herb from heavy taproot), erect or spreading, 5--60 cm, glabrous, occasionally glaucous. Leaf: segments obtuse or acute. Flower: bud erect, acute to long-pointed, glabrous, occasionally glaucous; receptacle obconic, with spreading rim 0.5--5 mm; petals 20--60 mm, orange, or yellow, bases generally orange. Fruit: 3--9 cm. Seed: 1.5--1.8 mm wide, round to elliptic, net-ridged, brown to black. Chromosomes: 2n=12. Ecology: Grassy, open areas; Elevation: < 2500 m. Bioregional Distribution: CA-FP, MP, w SNE, DMoj; Distribution Outside California: to southern Washington, Nevada, New Mexico, northwestern Baja California. Flowering Time: Feb--Sep Note: Highly variable, with > 90 taxa described; further study needed to determine if Eschscholzia californica subsp. mexicana (Greene) C. Clark (annual; cotyledons entire; DMtns), Eschscholzia procera Greene (pl large; southern SNF) deserve taxonomic recognition. 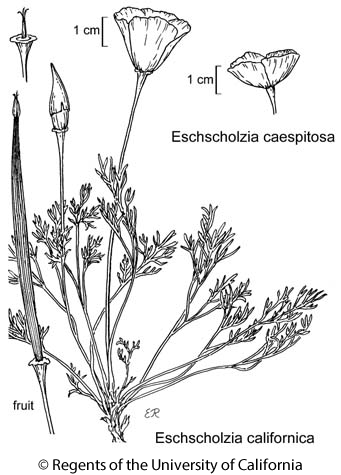 Citation for this treatment: Gary L. Hannan & Curtis Clark 2012, Eschscholzia californica, in Jepson Flora Project (eds.) Jepson eFlora, http://ucjeps.berkeley.edu/eflora/eflora_display.php?tid=25206, accessed on April 21, 2019. CA-FP, MP, w SNE, DMoj; Markers link to CCH specimen records. Yellow markers indicate records that may provide evidence for eFlora range revision or may have georeferencing or identification issues. Purple markers indicate specimens collected from a garden, greenhouse, or other non-wild location.